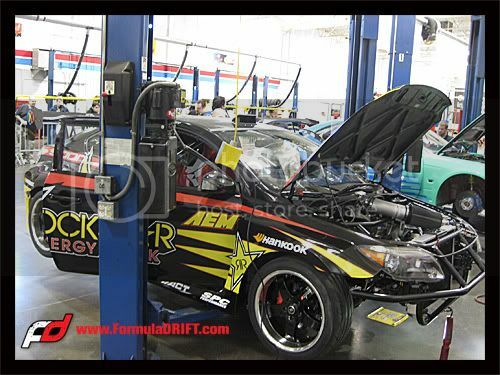 Be sure to check out Formula DRIFT tomorrow – Saturday April, 25 on NBC’s “Whipnotic”. Tune in to NBC Los Angeles at 5 PM and again on Sunday at 1:30 AM. If you miss out be sure to visit www.whipnotic.com for more info and to watch the full episode once it’s posted on their site. Also today during the 5PM or 6PM NBC news broadcast during the sports news an interview with Formula DRIFT’s own Vaughn Gittin Jr. from Round 1: Streets of Long Beach may air…stay tuned, set those TIVO’s, and be sure to not miss out! We’re here live at the Rancho Cucamonga UTI (Universal Technical Institute) campus for the Formula DRIFT Tech and Preview Day. The event is today until 4PM, so if you’re in the area make sure to stop by. We have food vendors, FD Apparel, car show, FD cars on display, and of the unveiling of brand new competition vehicles including the debut of Tanner Foust’s Scion tC!